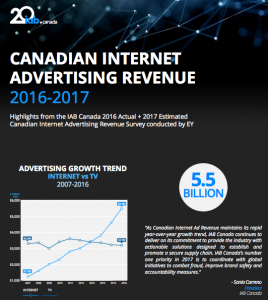 Canadian Internet advertising revenue reached almost $5.5 billion in 2016 (5.484 bil. ), up 19% from $4.6 billion in 2015. This continued the remarkable growth reported in the 2015 survey and represents almost $900 million over last year. Furthermore, the Internet increased its revenue lead to +72% over Television’s $3.192 billion in 2016, from +43% last year. The Top-5 reporting revenue earners generated almost all of the Internet growth in 2016. 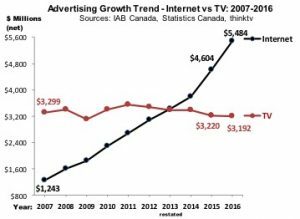 “As Canadian Internet Ad Revenue maintains its rapid year-over-year growth trend, IAB Canada continues to deliver on its commitment to provide the industry with actionable solutions designed to establish and promote a secure supply chain. IAB Canada’s number one priority in 2017 is to coordinate with global initiatives to combat fraud, improve brand safety and accountability measures”. Mobile (including Tablets) drove overall 2016 revenue growth again this year, rising to over 2.5 billion revenue ($2.542 bil. ), up from $1.6 billion in 2015. With a stunning 57% growth rate, Mobile now accounts for 46% or almost 1-in-2 digital ad revenue dollars, way up from 1-in-3 in 2015 (35%). Online desktop/laptop, which still represents the majority of Internet ad revenue at 54%, shrank 1% to just under $2.9 billion (2.942 billion). French Language Internet advertising revenue grew by 13%, less quickly than Total Canada, to reach $900 million in 2016. French language represents 16% of total Canada revenue in 2016, down one point from 17% last year. 2017 Revenue Forecast: Up +13% to hit $6.2 billion, with French Canada crossing $1 Billion mark. Respondents to IAB Canada’s 2016-17 Survey have forecasted that Internet Ad Revenues will grow 13% by the end of 2017, rising to $6.197 billion in Total Canada. This forecast includes a return to comparable growth in French language ad revenues of 15%, projected to increase to $1,036 million, regaining its 17% share of Total Canada revenue. Cautionary note: This forecast is an aggregate of budgets submitted by survey respondents in the 1st and 2nd quarters of 2016. As such, it may be superseded by later marketplace developments that make it more or less certain of being achieved, or possibly even surpassed. The top two Internet formats of Search and Display collectively represented $4.8 billion in 2016 — up from 4.1 billion in 2015. This is almost 90% of total 2016 Internet revenue in Canada (88%); adding video takes it to 97%. With +16% and 23% growth respectively, Search and Display are the two key formats behind the overall 19% Internet revenue expansion in 2016, assisted by Streaming Video’s much faster +34% trajectory, growing to $481 million. Video’s share of Total Internet revenue rose by 1 share point to 9%. Search and Display also represented 90% of Mobile revenues in 2016, with video accounting for virtually all the rest. Growth in Display and Video’s combined Mobile share to 51% in 2016, compressed Search’s share of Mobile to 48% from 54% the year before. The Mobile ratio is growing at Online’s expense for each of the 3 main ad formats – rising to 56% of Display (versus 44% for Online), 47% of Streaming Video and 42% of Search. French language Display and Search are also the principal drivers behind French Canada revenue growth in 2016, rising by 11% and 12% respectively over 2015. Only Video grew faster, +42% in French Canada. In 2016, Internet ad revenue, including Online & Mobile (+Tablets) increased its revenue lead over TV from +43% in 2015 to +72% in 2016. TV revenue declined by -0.9% in 2016 to $3.192 billion from 3.220 billion (Source: Statistics Canada, June 20, 2017). -Sonia Carreno, President, IAB Canada.